Today Synology released its DS1515 and RS815 units. Both are based on ARM processors which has been a trend in cold storage NAS units lately. 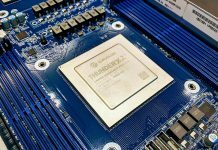 For example we saw the Annapurna Labs chips used in Gigabyte’s ARM storage servers recently. These ARM processors generally offer lower power consumption and provide adequate performance for many NAS applications. Synology has become a go-to choice for users based on its DiskStation Manager (DSM) software that receives regular updates with new SMB and home focused features. The Synology RackStation RS815 is a short depth 4-bay 1U rackmount chassis. It is 12 inches deep which is one of the smaller rackmount NAS units we have seen recently. It has dual gigabit Ethernet ports, and a dual core Marvell Armada XP MV78230 1.33GHz processor with hardware encryption. It does seem as though this is a significantly lower performance offering than the DS1515 but does come in a smaller package. The RS815 is rated at up to 216MB/s read and 121MB/s write speeds in RAID 5. It seems as though the SoC is not powerful enough to drive line-rate write speeds. The Synology RS815 carries a 25.3dba rating which is quiet enough for a cabinet. It is spec’d to only consumer 14.35w with hard drives in hibernation which is extremely low. This low heat output can be important in closet telco racks with sub-optimal cooling. The Synology DiskStation DS1515 is a 5-bay NAS unit with quad Gigabit Ethernet standard. The DiskStation chassis will be familiar to those who have researched the DS15xx series before. Annapurna Labs Alpine AL-314 quad core 1.4GHz ARM CPU. 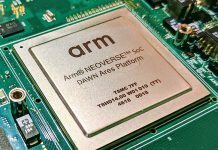 The details on the SoC are sparse but we do believe it has hardware encryption support and is driving the Gigabit NICs. Annapurna Labs was acquired by Amazon in January 2015 and is seen as a hot SoC vendor in this space. 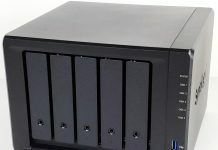 We are certainly interested to see performance figures from the Synology DS1515 as the unit carries a 22.4dba rating due to its low power design. It allegedly will consume 18.2w with hard drives in hibernation mode which is excellent. Previous articleNew m.2 Samsung NVMe SSD outed by HP! Do any of these NAS boxes use ECC?